This range day I was accompanied by several co-workers and friends. The hardware was rather impressive: From an M-4 carbine, a Bennelli super 90 to several glocks and sigs. The Taurus was generally regarded by everyone who fired with one word: sweet! Most were very impressed to how narrow the pistol is even with the large capacity mags. The fit was very tight from the box and rounds grouped easily inside a 3x5 at 15 yards. After 400 rounds, we experienced only one failure to fire. It was clearly caused by a too new magazine spring pushing the 12th round against the bottom of the slide. The recoil was not bad, considering this is a very light polymer weapon. 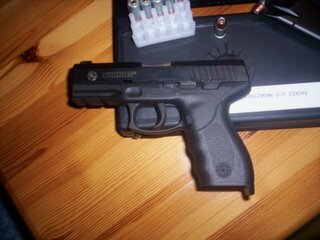 A bit worst than my Beretta cougar, but I did fire 200 rounds myself so a bit of hand wear was to be expected. Assembly and disassembly is fairly straight forward if a bit tricky the first time. All in all, a keeper. Your post has tempted me to try the 24/7 out. I have smaller hands also and have a Kahr right now. Great gun, but low capacity.